The free Logic Design Draw (LDD) software is a graphical WYSIWYG tool that enables a user to quickly create a computer logic schematic diagram and simulate it. Logic circuits can be very simple, such as and-or logic, or can consist of hundreds of parts. Both basic parts (logic gates, flip-flops) and MSI (Medium Scale Integration) building blocks are available. Using MSI/Macro blocks, large hierarchical designs - such as a small computer - can be built. 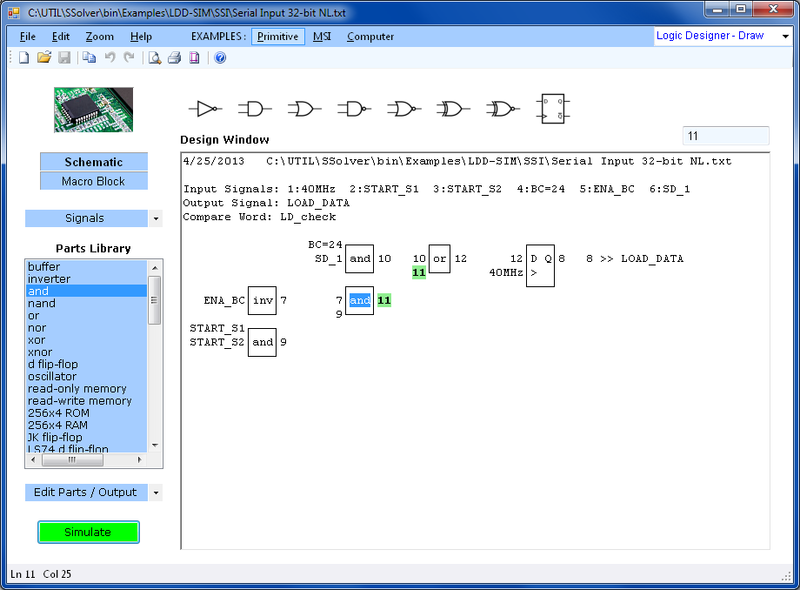 The LDD Design Window is used to build logic schematic diagrams. It can also be used to convert any schematic diagram to a single 'Macro' block, which can be saved as a new part. To design a logic circuit, input signals are defined, parts are added to the schematic and connections between the signals and parts are made. After each change, LDD automatically updates the schematic layout. See Logic Design Draw Help for detailed documentation. At any stage of the design, the Simulation Window can be opened by pressing the Simulate button. Additional MSI functions can be built using the 'Macro Block' mode. 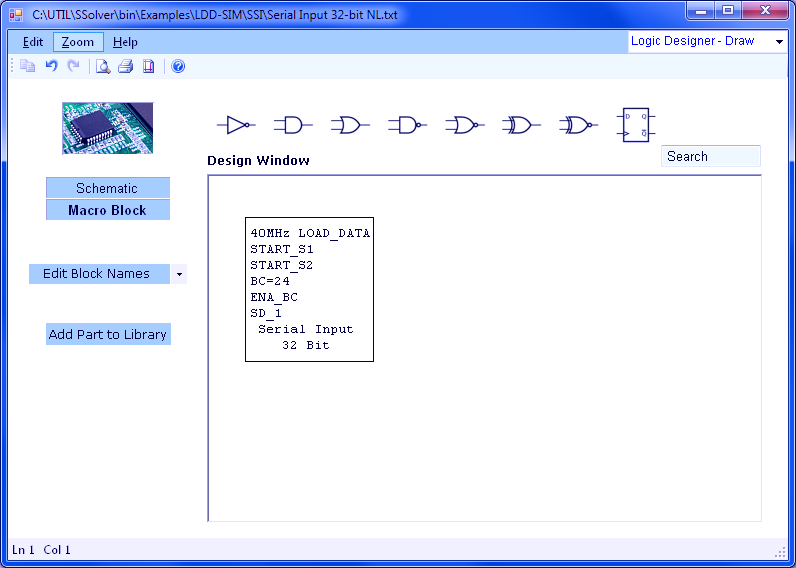 The LDD Simulation Window is identical to the Output-Circuits window of the Computer Logic Simulator tool. 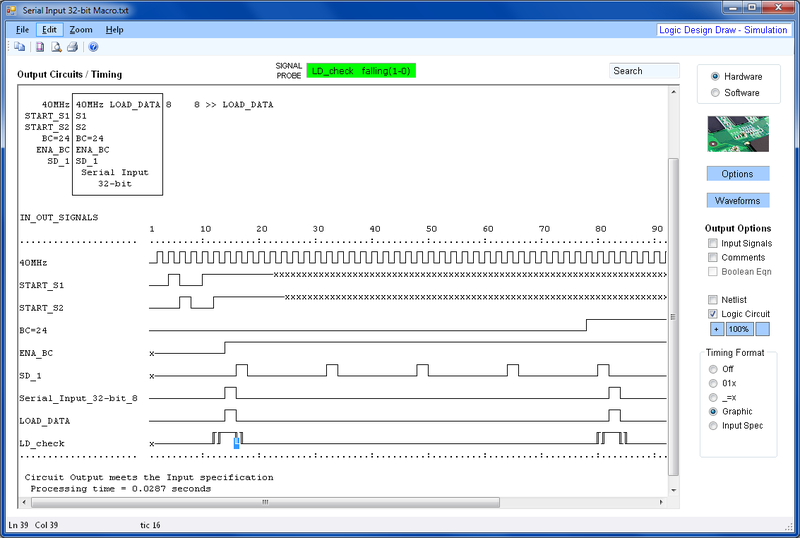 It also provides an Options sub-window to select flip-flop initialization modes, and a Waveforms sub-window to edit input and compare signals.